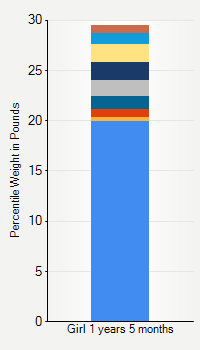 This chart shows weight percentiles, according to the CDC, for girls 1 year 5 months of age. To determine an individual's percentile, find the range that includes their weight. This percentile is not a reflection of optimal weight for an individual, it is only for comparing against a population sample. Use the navigation links above the summary chart to view the weight chart for a different age, or to switch between boys and girls or pounds and kilograms.